Welcome back to the Vintage Inspiration Party! We’re glad you joined us! Your links will show up on all 4 blogs, so we can’t wait to see what you have to share! i love the simplicity of this framed kitchenware from Organized Clutter. 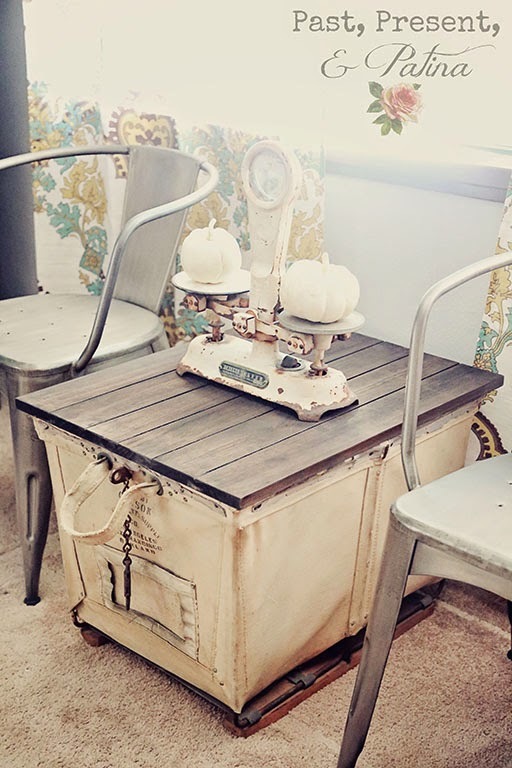 Past, Present, and Patina turned a laundry cart into a fantastic, industrial styled table. 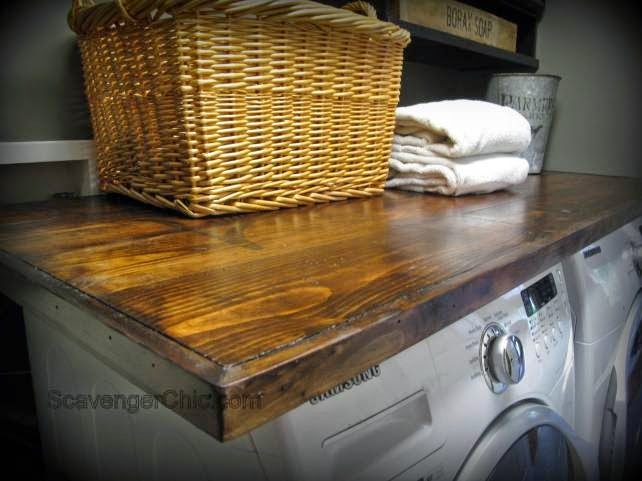 Scavenger Chic shows us how to make a wood counter–love the look and the price! I love a corner Hutch and Happy at Home gave this one a beautiful makeover. 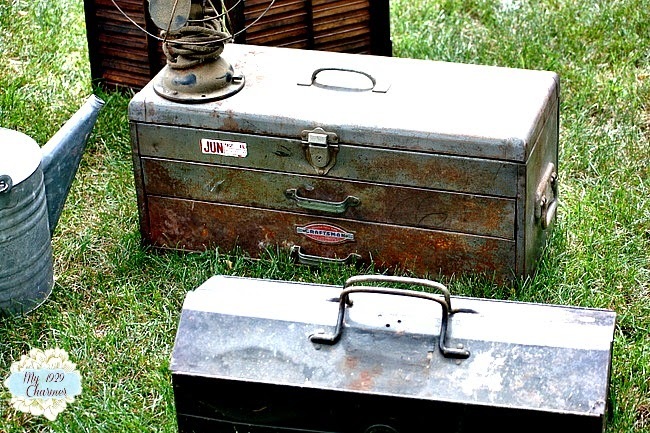 My 1929’s Charmer shared some lovely junkin’ finds–I adore these toolboxes. Everyone who was featured is welcome to put this button on your blog! – By linking up with the Vintage Inspiration Party you agree that your photos and links may be shared on Pinterest, Facebook, and other social media sites. You may be included in a round up to promote the party or individually, with a link back to you. We love what you share and the extra exposure is a benefit to everyone. Angie, I really appreciate you hosting this party! Thanks for the feature….and so glad you liked my junkin finds as much as I did. I shared my deck reveal which is filled with vintage windows, hoosier cabinet, old wicker chairs etc. Oh the pumpkins are not new! Have a great day all! I loved Cathy’s finds from last week. Thanks to all of you for hosting. Thank you so much for featuring my wood countertops. So easy, even I could do them. Of course I had to link up my projects again. Have a great week. 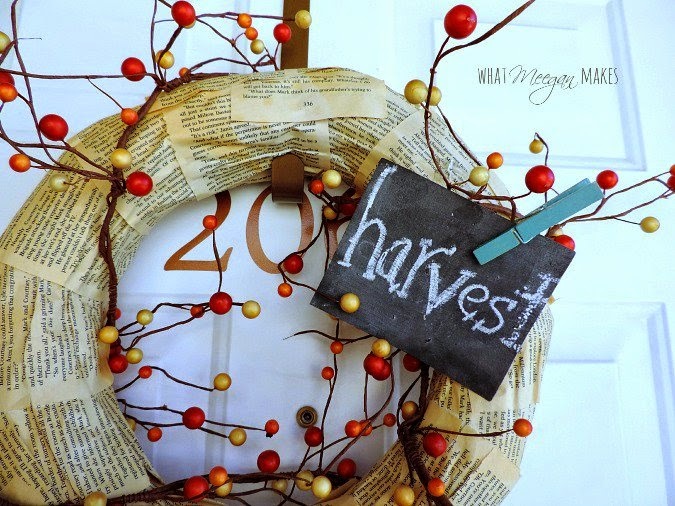 Thanks SO much for featuring my Fall Book Page Wreath! I am honored and look forward to sharing the button on my blog. Make it a fabulous week. Before I run out of week, I just wanted to thank you for hosting this party. There’s always lots of inspiration.